The requirements analysis phase answers the question, “What does the user need and want from a new system?” The requirements analysis phase is critical to the success of any new information system! In this milestone we need to identify what information systems requirements need to be defined from the system users’ perspectives. • Data flow diagrams and narratives are easy for users to understand. In this milestone you will first uncover external agents, processes and data flows that define the requirements for the proposed system and document that information. You will use that to build the Context Data Flow Diagrams. • Understand and perform the techniques for requirements discovery. • Construct the Context DFD using VISIO. Now that we have studied the current system and analyzed some of its problems and opportunities, plus gained approval to proceed, we can now start to identify the business requirements for the system and model them. In this assignment we will use our results of the previous Milestone and transcripts of an interview with the Equipment Depot staff. The results of this activity will identify the system requirements for the proposed system. Exhibit 3.1 is a copy of the transcript of the interview. Refer to the transcript, sample forms, and results from Milestones 1 and 2 for the information necessary to complete the activities. Deliverable format and software to be used are according to your instructor’s specifications. Deliverables should be neatly packaged in a binder, separated with a tab divider labeled “Milestone 3”. For the advanced option, compile the process description to note processes’ input and output. 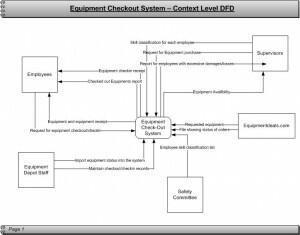 Use the following narrative to construct the Context Data Flow Diagram for the Equipment Check-out System (ECS). The purpose of the Equipment Check-out System (ECS) is to provide maintenance employees with the equipment needed to complete their maintenance jobs. Employees will occasionally request equipment check-outs. The Equipment Depot staff will maintain records of those check-outs and provide the employees with the appropriate equipment and an equipment check-out receipt. When employees have finished with the equipment, the employee must conduct an equipment check-in at the Equipment Depot. In response to the equipment check-in, the Equipment Depot staff will maintain records of the equipment check-in and provide the employee with an equipment check-in receipt. Occasionally, supervisors will make request an equipment purchase that results in the Equipment Depot staff needing purchase equipment through equipmentdeals.com. The supplier daily sends an electronic file showing the status of all orders, which will be imported into the system so that the Equipment Depot staff can field status requests from supervisors. When the Equipment Depot staff receives ordered equipment, they will use the packing slip to verify the shipment and notify the requesting supervisor of their availability. The Safety Committee will periodically submit a list of employee skill classifications that can safely check-out any piece of equipment. Supervisors will submit the skill classifications for each employee. Upon request the system will generate a report for supervisors listing employees having a history of excessive equipment losses or damage. Upon request the system will generate for employees a statement detailing what equipment they have checked out and are expected to have in their possession. I do need milestone 3 and 4 together. can you provide that. yes sure. i can. please contact me at support@iqrajavaid.com.